This is one of the all time best selling Single Malts out there, and you should be able to find this almost anywhere on the globe. Light, white fruits and loads of apples in the smell. Sweet vanilla and burned oak in the background. Malty taste. Fresh green apples, a bit spicy but nothing much. Quite a long finish considering the low ABV. Burned sugar and caramelized apples, without it be in particular sweet. Some gentle oak and spirit notes accompany it all the way. A fair dram, but nothing spectacular. 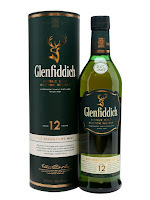 I would go for the Glenfiddich with higher ABV or extra years of maturation. I feel I miss something all the way through. Fullbodiness, flavours or just some extra influence from the casks. I will give this 81/100 (20/20/21/20).